This recipe was requested by one of my followers. She said she had this meal at a sister-in-laws house years ago, loved it and wanted a recipe to cook it for her family. 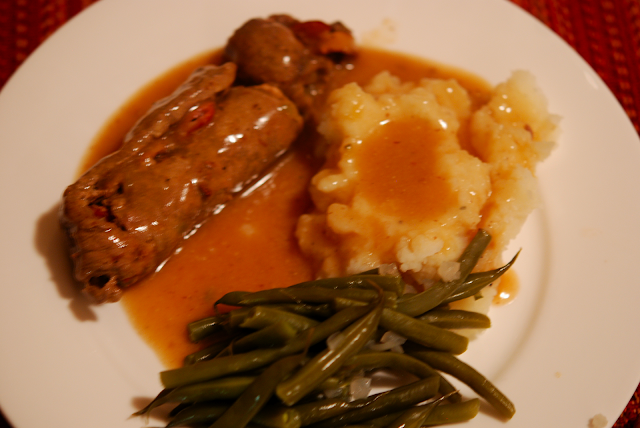 So I experimented with several recipes and came up with my version of this fine German dish. I hope you like it Mary O. I have made this three times now and my hubbie loves it. We had a friend in from out-of-town this week and that was the first thing my better half wanted me to cook for him. This is how it works. Don't let all the steps intimidate you, it is really easy to make and it is delicious. 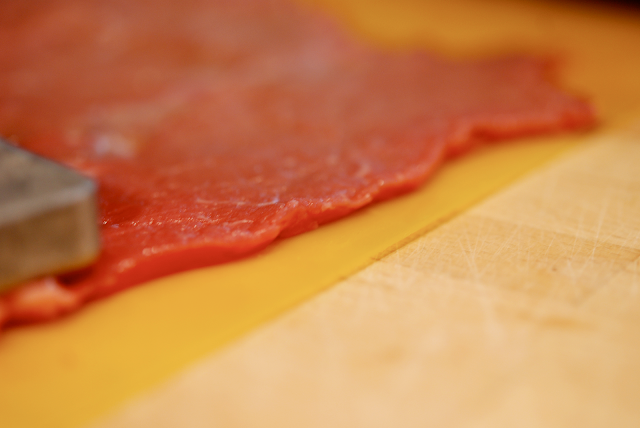 Note: Start with meat that is no more than 1/2 inch thick, preferably 1/4 inch thick. You may need to get your butcher to cut the meat ahead of time for you. Otherwise you will be beating the meat forever and still not get it flat enough. 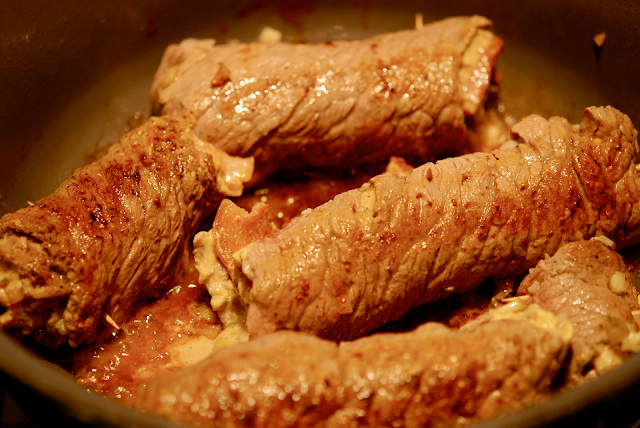 I have used top round and bottom round steak. Both are excellent. This shows you the thickness. Be sure not make any holes when pounding the meat down. 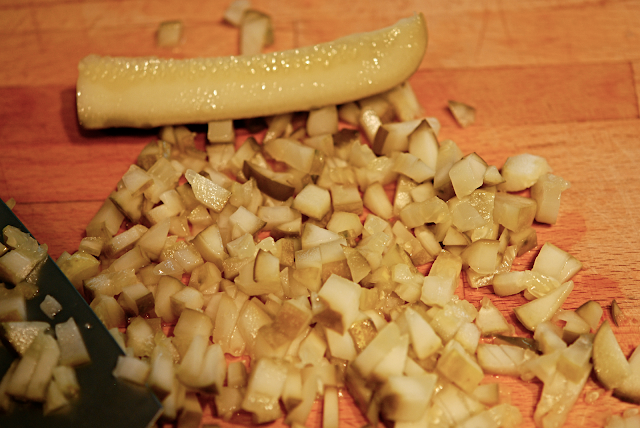 Finely chop crunchy dill pickles. In a large 10 to 12 in round, deep pan that can be transferred from stove top to the oven, cook the bacon until brown but still limp. Drain on paper towels. 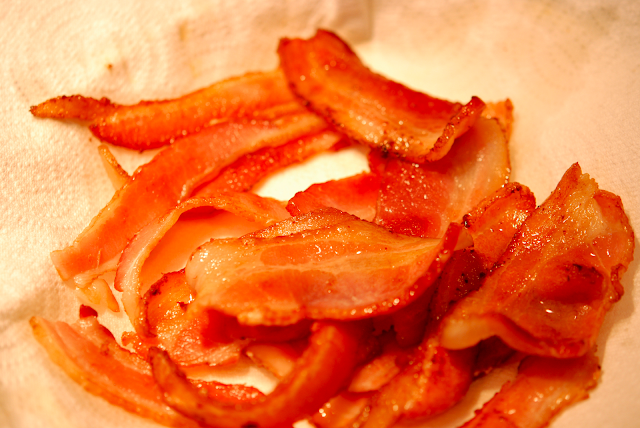 Keep the fat from bacon to brown the rouladens. 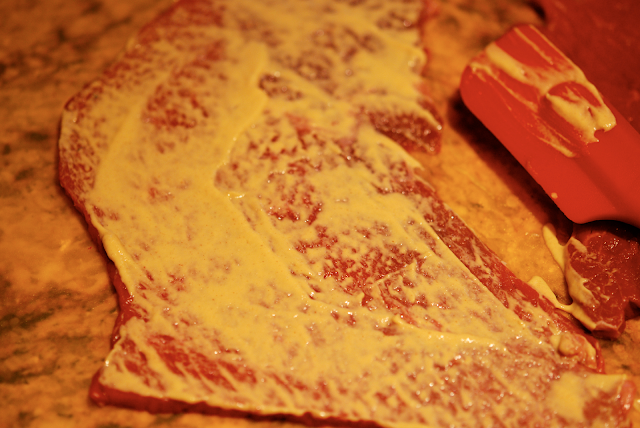 Spread 1 heaping teaspoon of dijon mustard onto each piece of meat. Salt and pepper meat and layer first with chopped dill pickle. 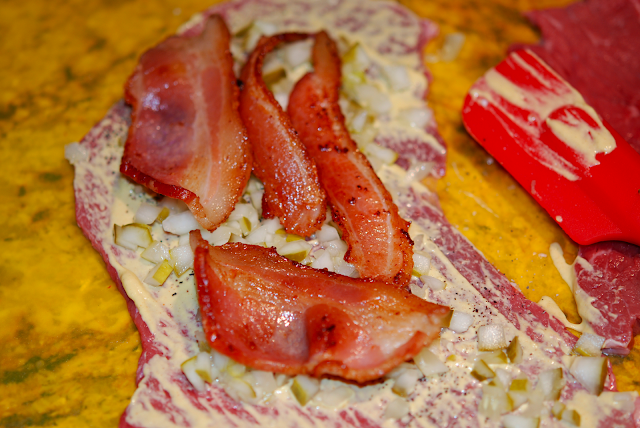 Lay bacon on top of the pickle. 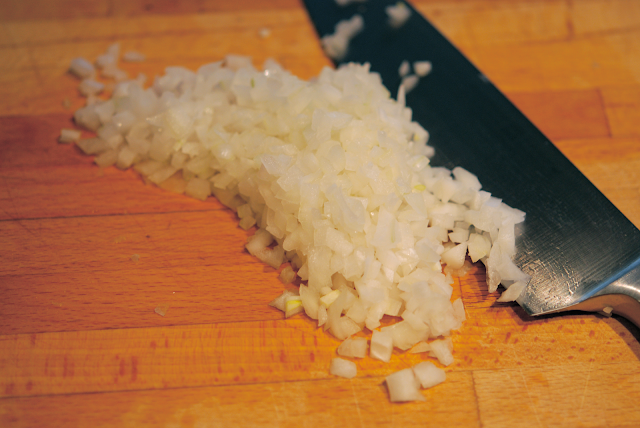 Now add the chopped onion. Now your ready to roll and secure with wooden picks. 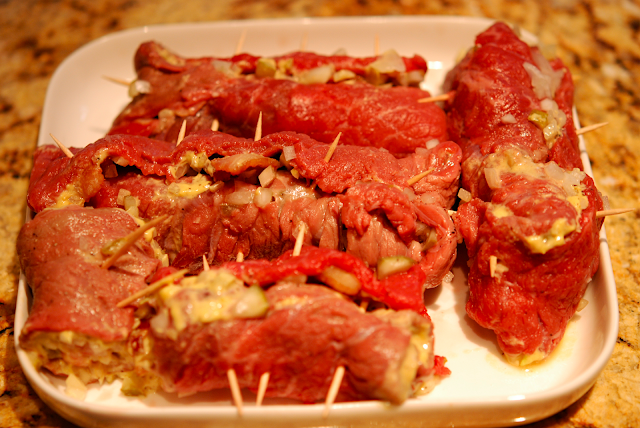 Continue to layer ingredients on the meat and roll the rest of the meat in the same manner. 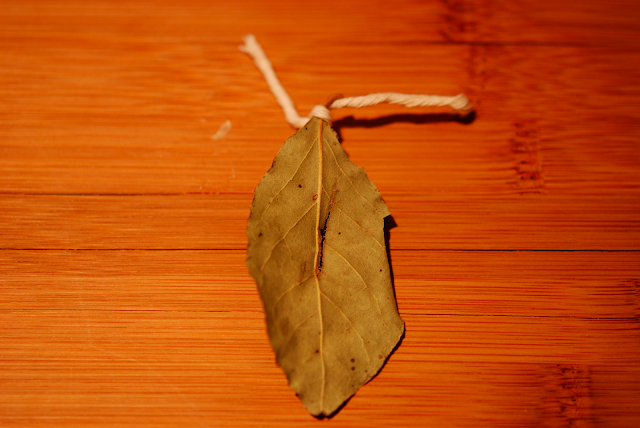 Hint: Tie a string to bay leaf, easier to find in the end! In the remaining fat left from the bacon, add 1 tablespoon of olive oil over medium heat and brown the meat rolls on all sides. Add the beef broth, bay leaf and water until the rolls are almost covered. Bring to a boil and reduce the heat to a simmer, cover and simmer for 1 hour and 45 minutes. After the meat is done, remove from dutch oven and keep warm. 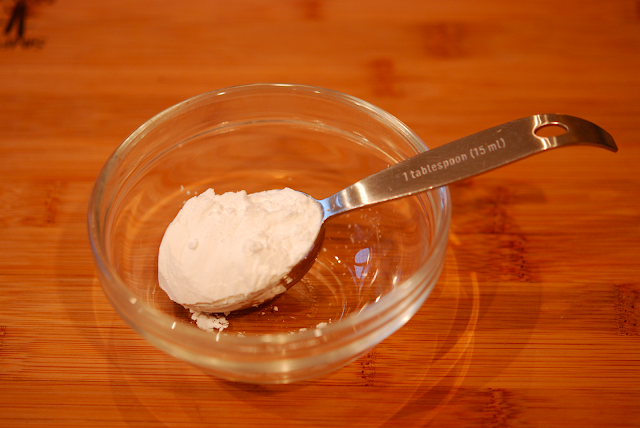 Take 1 tablespoon of cornstarch and add cold water to make a slurry. Slowly add slurry to the sauce in the dutch oven to make the gravy. 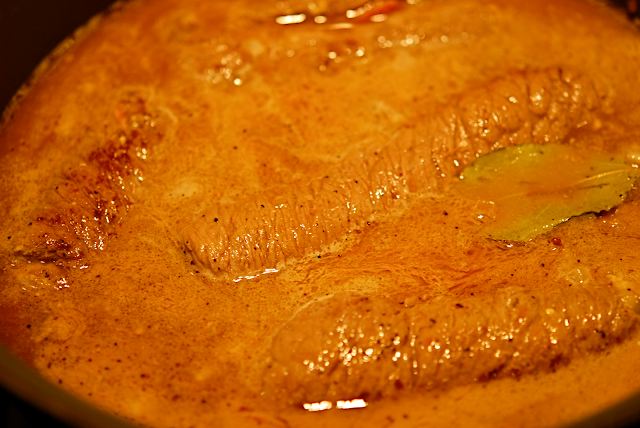 Add more cornstarch mixed with water if the gravy needs to be thicker. 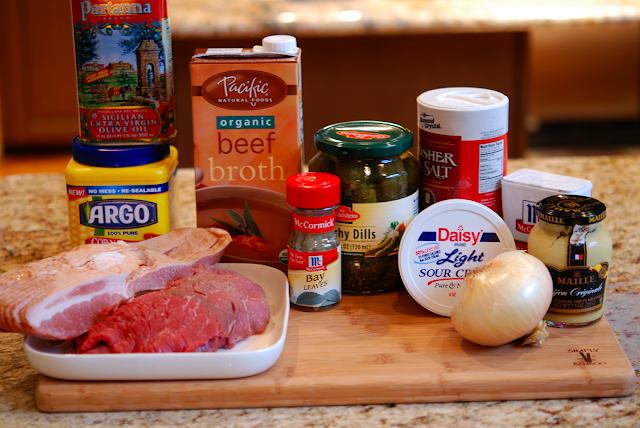 I usually start with 1 tablespoon and add more to it until I get the thickness that I like. Taste and adjust the seasoning. 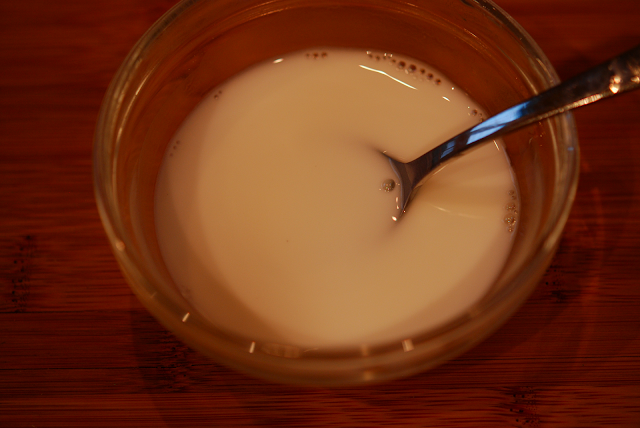 Add 1/4 cup of sour cream and stir until completely incorporated. Pound cutlets with meat mallet in between 2 sheets of plastic wrap until 1/8 inch thick. 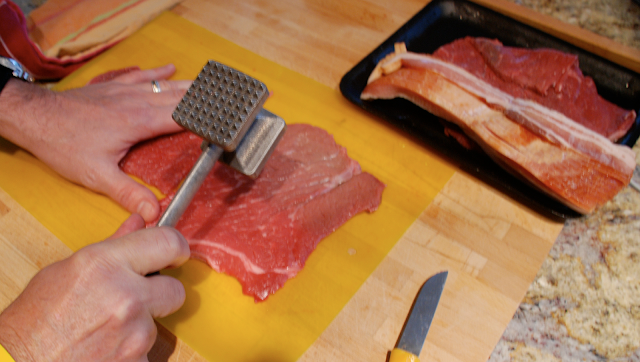 Do not pound so much that you make any holes in the meat. In a large 10 to 12 inch round, deep pan that can be transferred from stove top to the oven cook the bacon until done but still limp. Drain on paper towel. Keep remaining bacon fat for the browning of the rolls. 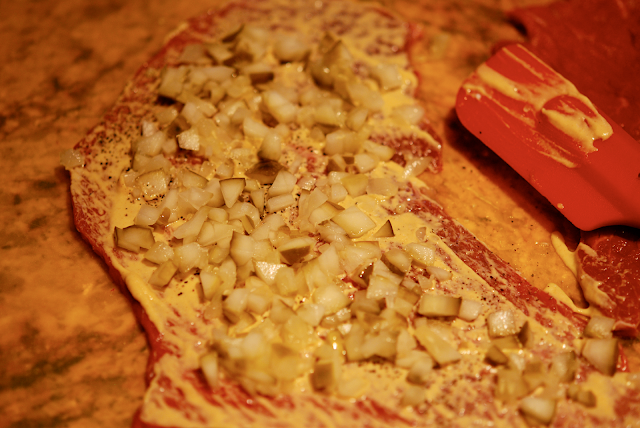 Spread each flattened cutlet with mustard, and then sprinkle with salt and pepper. 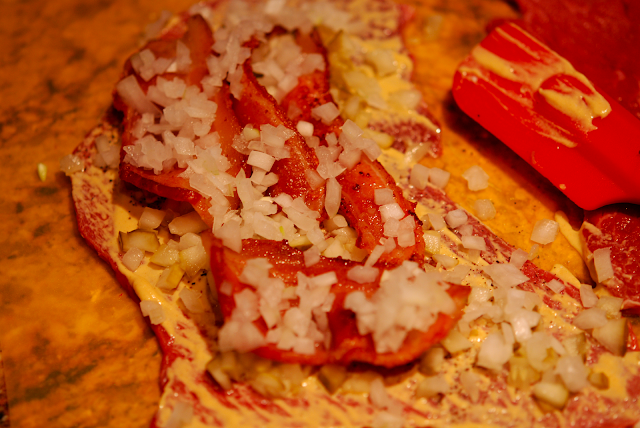 Divide the chopped pickles, bacon and onion evenly between the cutlets. Roll up jellyroll style and secure with wooden toothpicks. In the same pan you cooked the bacon, heat the remaining fat from bacon and add one tablespoon of olive oil ; add the steak rolls and brown well on all sides. Pour in the broth, 2 cups water and the bay leaf. 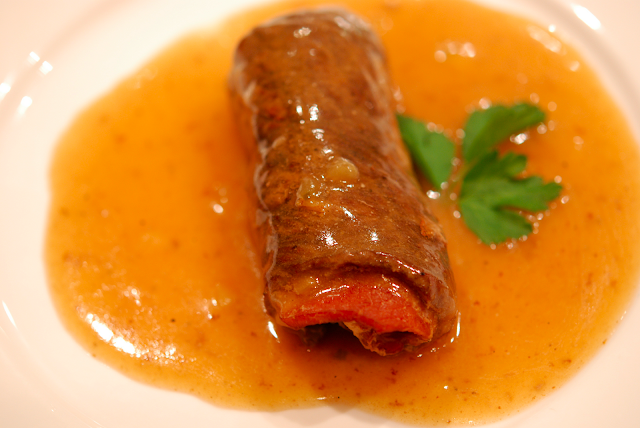 Make sure the rouladen is almost covered with broth and water. Cover and simmer for 1 hour 30 minutes. 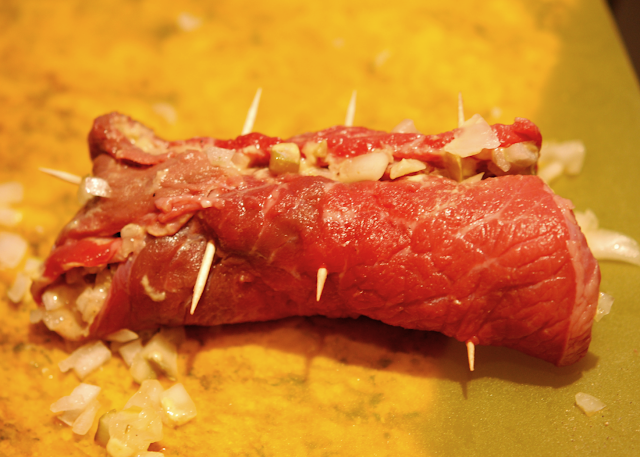 Remove the rouladen and keep warm. Blend the cornstarch with ¼ cup water and add to the broth left in the Dutch oven. Bring to a boil and cook until thick and bubbly. 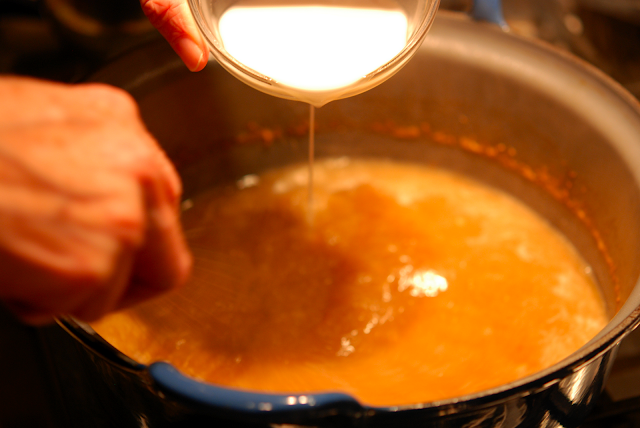 Add more cornstarch mixed with water if you need to thicken broth more into a gravy consistency. Stir in sour cream and heat through. Taste and adjust season as necessary.